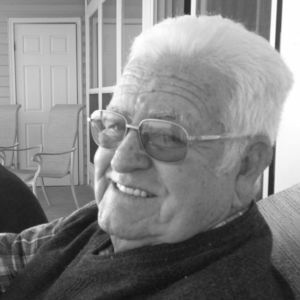 William Nixson Fruge', 91, of Owensboro, Kentucky, died peacefully surrounded by his family at his home on January 20, 2019. A son of the late Viellor Jack Fruge' and Ophelia Doise Fruge', one of nine children, he was born in Kinder, Louisiana on February 24, 1927. He served in the United States Marine Corps, 1948-1952, during the Korean War. In Hawaii he served under the command of the legendary Lieutenant General Chesty Puller, and later at the Naval Ammunitions Depot in Crane Indiana. There he met his bride Jean Litsey. They married in 1951 and lived their lives' adventures together for 68 years. In 1954 he moved his family from Lake Charles, Louisiana to Owensboro where he owned and operated the Professional Dental Laboratory until 2016. He was an avid duck hunter and sportsman, and a member of the Lincoln Trail Amateur Retriever Club. He was later introduced to golf, which he enthusiastically played for 35 years. He is survived by his wife, Jean Litsey Fruge', sons Eric (Susan) Fruge' of Lexington, Kentucky, and Kent (Kathryn) Fruge' of Owensboro, daughters Ann Jeanette Pierce of Owensboro and Cydney (William) Cunningham of Richmond Hill, Georgia, 10 grandchildren and 9 great grandchildren. He is also survived by a brother, John David (Doris) Fruge' of Moss Bluff, Louisiana. He was a good man, full of faith in God. The funeral service will be 12:00 p.m. Wednesday at Glenn Funeral Home and Crematory, where visitation will be from 4:00 until 7:00 p.m. Tuesday and after 11:00 a.m. Wednesday. Burial with full military honors will be in Rosehill Cemetery. Expressions of sympathy may take the form of contributions to Hospice of Western Kentucky, Autism Speaks, or Cooks Children's Hospital, Ft. Worth, TX.